Students from multiple bands jamming out onstage. while the judges decided who they thought should win. Last Wednesday night, Venture Church was filled with funky riffs and lyrics, all created by SDA students. Our annual Battle of the Bands competition was held at the church across the street from our school. Judges consisting of local musicians, and former SDA students and Battle of the Bands participants got to watch the top five bands and decide who was the ultimate SDA band of the year. First up was Donegal Tweed, consisting of senior Jared Miller on electric guitar and vocals, junior Tyler Brown on drums, and junior Mateo Murphy on bass. They played three original songs. Second to perform was sophomore Alex Holzman, who rapped a cover of Rap God by Eminem. Holzman also performed an original rap about his own life, making pop culture references over the back tracks of popular rap songs. Next was Skulpin Bomb, a band consisted of junior Lucca Stastny on bass and vocals, junior Ethan Belford on electric guitar and vocals, and graduated student Max Belford on drums. They played four original songs. Ethan’s electric guitar and Lucca’s six-string bass were made by them in Mr. Germano’s guitarmaking class. After a 10 minute intermission, Cup performed. Cup consists of senior Caeden Schlosser on trumpet and bass, junior Shawlin Tucker on bass and vocals, junior Tyler Brown on drums, junior Jude Irons on electric guitar, and junior Eli Anderson on keyboard and saxophone. They played four original songs. “Hey I’m sad. Because there’s no one in this entire audience standing up!” Tucker said, invited up the crowd to dance around to Cup’s song, Funkytown. 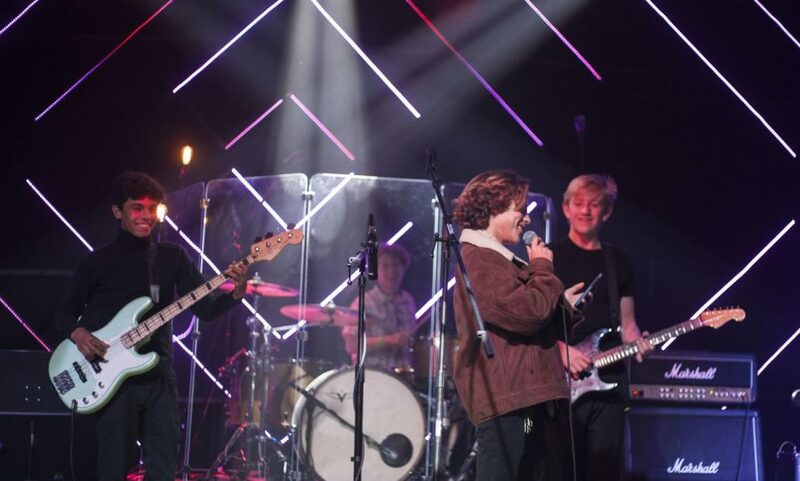 The last band to perform was The Elements, consisting of junior Eli Anderson on saxophone, keyboard, and vocals, senior Julian Boyer on bass, keyboard, and vocals, and senior Dylan Herrera on drums and keyboard. They played three original songs, each one they all played different instruments on. After all the bands played, ASB student MC’s invited up all band members to mess around on stage while the judges decided who they think won. Many students ran up with their instruments, jammed out, and entertained the crowd. Then the results were in. Third place went to The Elements. Second place went to Cup. First place went to Skulpin Bomb. “I first met Lucca in seventh grade English class. I walked up to him and said, ‘Hey do you listen to Iron Maiden?’ and he said ya. Then both of us made food together. We perfected falafel. Then we thought that if we can make all this gross falafel, we might as well make some gross music.” said guitarist Ethan Belford.